Mortlake, Surrey, The Olde George Public House c1915. It is possible that the man in the photograph is the landlord, Hubert Barrett. There is still a pub at 40 High Street Mortlake, a modern pub called the Charlie Butler, named after a Youngs Brewery drayman. Postcard published by Richard Johns of Tooting. Click the pictures to enlarge. Hi Howard, your whole idea for your blog is fascinating! I'd never even heard of Street View before. Today's postcard is really neat; it sure would have been fun to go there way back when. Thanks so much for stopping by to say hello. I'm your newest follower, and will put your blog on my sidebar under the postcard section. Good to see that the Charlie Butler still sells Youngs. I tried to enlarge the street view to get a look at the gable end but did not succeed. I wanted to know whether Youngs name was on there still. 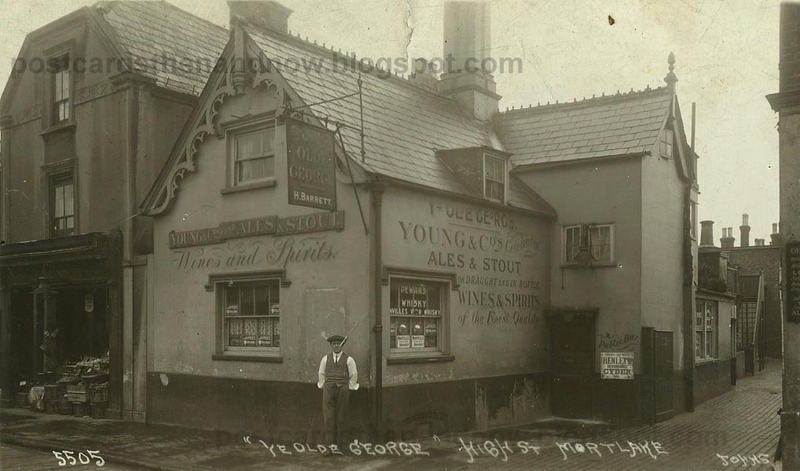 The Charlie Butler is still a Youngs pub, though Youngs is no longer brewed in Wandsworth. It is brewed by Charles Wells, somewhere in Herts I think. They've almost got the taste right after five years of trying. What a wonderful places. I love all the signage painted on the walls. Beautiful. I thought maybe the gent in the picture was Ye Old George, himself. Thanks for your visit to my pub songs post. I'd love to be there tomorrow when you toast everybody in the pub. Did you notice the guy drinking out of the trophy cup? It might end in a fight if somebody owns it. Now here's an inviting place. I think I'd like to step right in there. By George, there's another George! BRING BACK THE OLD PLACE!! It's funny you called the man in the photo perhaps the landlord! When I was researching some of the England pubs they all referred to them as having landlords...in America they usually call them business owners or owners, but a landlord is usually only connected to houses or apartments here in America. I really like the photo of your pub! Fantastic old building - I wonder what it looked like inside? Another helping - thanks for that. I can't imagine having too many pub photos, so keep adding more. You just lengthen the list of pubs I need to visit before I am too old. What a cute little building! I love the windows and gingerbread around the roof! Oh the old pub was lovely, I would have liked to have spent some time there. I'm fascinated with "then and now". Wonderful! I really enjoy seeing those old classic buildings. What a charming building the old one was! And I, too, love the signs painted on the walls. I think that must be a lost art, these days, to paint such beautiful lettering by hand. I wonder when the old building was torn down. 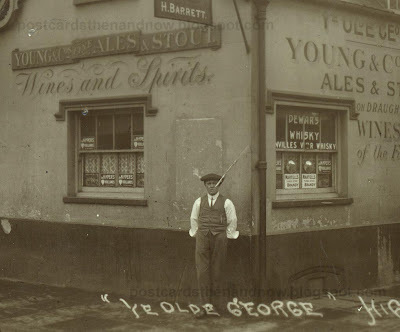 In the 1861 Census 52 Mortlake Street is listed "Old George" P,H (Public House). Head of the household was what looks to be a "George Sailin Devy". My relative was living at 50 Mortlake Street Edward Goodale, builder. Thanks for sharing the picture! and died there in 1856. His son George William Day took it over.